A 3D action RPG inspired by the early Final Fantasies. If you've played the original Final Fantasies—not their remakes—complete with chunky old sprites, chirpy chiptune soundtracks, and enthusiastic but badly translated scripts, you should probably check out Stephen 'thecatamites' Murphy's Magic Wand. I don't entirely know what's going on it, but I've really enjoyed exploring its colourful, Final Fantasy-style world since the game released last weekend. I love New Vaders' soundtrack, which is upbeat, occasionally soaring, and the perfect accompaniment to Murphy's bright, characterful sprites and textures. You'll battle enemies, you'll chat with strange creatures, and you'll acquire coins and health potions as you rotate and jump your way around a happy little diorama of a world. 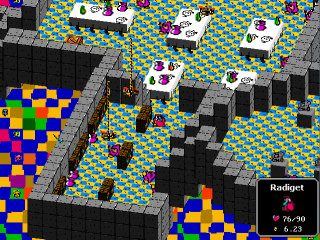 It's a kinda-isometric action RPG, this. You can use the mouse to rotate each environment, making it feel like a sort of dollhouse you're peering in on from up high. I've been playing for an hour or so now, and I've not run out of world to explore yet. I've been in a desert, a ghost train, a castle full of creatures trying to murder me, and I want to persist to see what other environments Magic Wand is going to show me. If this sounds like something you might enjoy, you can grab the game here. I've stashed a trailer somewhere inside this article.